So here’s one of those writing supplies that drive me nuts. 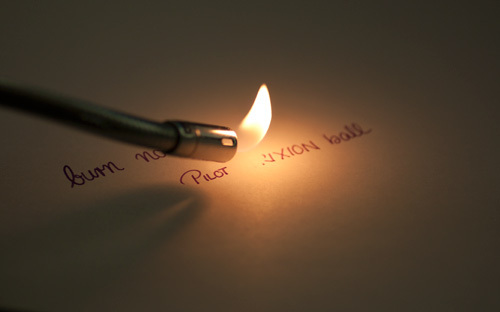 By the way, please use your lighter beneath the sheet of paper instead above or even better don’t do it that way at all, I just did it that way to get a nicer photo ;). It’s enough if you just leave your piece of paper upon your heating or use your hairdryer to make the ink disappear. So whatever you do with them never ever use them for signing important documents. Yet in case you already wrote something with it and the ink disappeared magically, there’s a simple resolution to it: put the piece of paper into your refrigerator for a couple of minutes. The ink will reappear. It will be more faded in color, yet still readable. I tried to emulate the refrigerator with an ice cube for the sake of a nice photo again, but it didn’t work just as good. This has to be my fist painting in about 3 months or maybe longer. Well, okay, I did paint smaller paintings, but mainly into my sketchbook with WC pencils or with gouache, but I did not really paint on a canvas for a very long time. It’s an acrylic painting and the truth is I cannot handle acrylics anymore. After painting with oil colors for over a year I’ve grown so used to them that it feels awkward to paint with acrylics. They’re so fast drying (and mind you I used the Interactives and the Golden Open which both already have a prolonged open time compared to normal acrylic colors!) and they just don’t blend as well as oil colors do. Seems the only good thing about them for me is that now I don’t have to wait for months until I can varnish them and I also don’t have to worry about finding a space in my rather small studio where I can leave them to dry, as the painting is already dry to the touch now, only three hours later. I’m determined to switch to oil color from now on. Yet I still have a huge pile of acrylic colors so I’ll try to use them up as soon as possible. 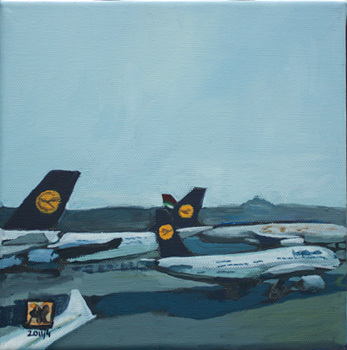 Guess I will have to finish a couple more acrylic paintings in the next days. IN my neverending endeavors to make this blog simpler to navigate and easier to read I’ve once again changed the theme. 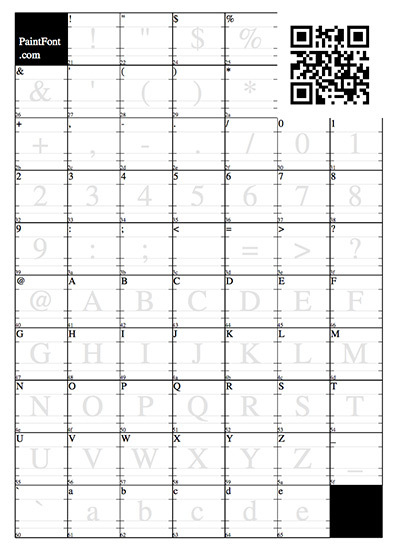 “Simpla” was already nice and clean, but I think that “Oulipo” is even more so. Also I’m currently checking all the links in order to replace or delete the broken ones. For some strange reasons folks tend to believe that someone who collects pens would also have a large collection of inks. So they sometimes would approach me and ask my opinion on different sorts of brands and their colors and most of the time I would have to tell them that I’m really sorry, but I haven’t ever tried one single bottle of that ink. 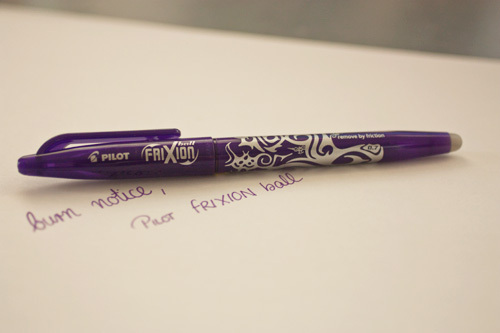 Since I use my pens mostly for writing, I prefer dark colors that are clearly and easy visible to the eye, mainly colors like blue and black and some dark reds and purples just for the fun of it. When sketching I work with lightfast and waterproof blacks only. So there’s no need for other colors, because they will end up dried and unused. Well, here is my small ink collection, the ones I currently keep in my desk shelf. Okay, I guess it’s obvious why I just had to get that bottle, right ;)?!! 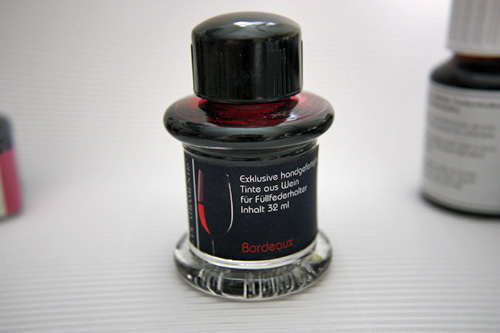 When I first heard of ink made of real wine I was very curious to try it. It’s a nice dark red color, once dried it reminds me a little bit of blood colorwise. And it really does have a nice faint smell of red wine. 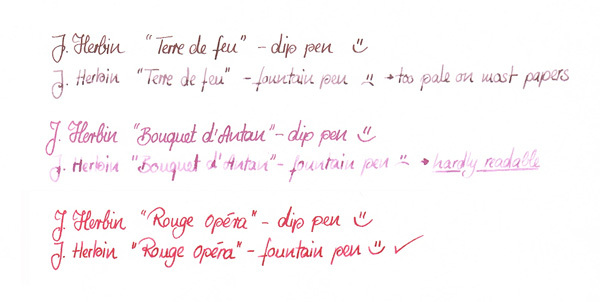 Herbin "Opera rose" and "Bouquet d'Antan"
And even more reds. 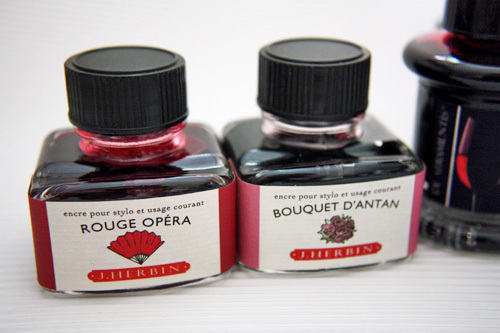 “Opera Rose” and “Bouquet d’Antan” by Herbin. Lovely colors, lovely flow, but I don’t use them too often. I hope they will last me a couple of years. Rohrer & Klingner "Scabiosa" and "Salix"
Rohrer & Klingner iron/gall-nut inks “Scabiosa” and “Salix”. 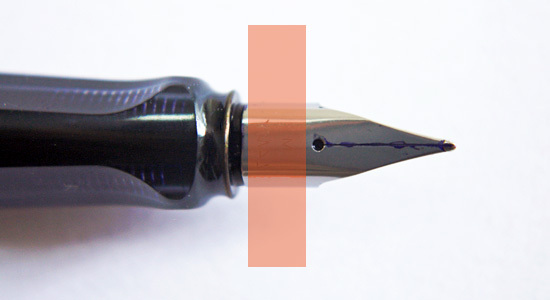 Iron/gall-nut inks are not supposed to be used a long time in a fountain pen, because those inks are known to clog up. As long as you clean your pen after using you should be fine though, at least I never had any problems even after leaving those inks for a few weeks in my pens. “Scabiosa” is an interesting color. It’s a pale purplish rose if you use it in a fountain pen, but it will look like a grayish violet if you use it with a dip pen. “Salix” is a pale blue. 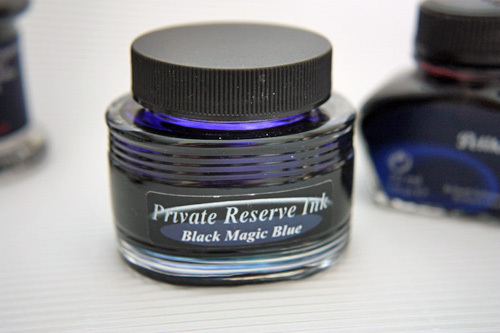 Private Reserve Ink "Black Magic Blue"
Private Reserve “Black Magic Blue” is my favourite blue ink for writing. In my oppinion it’s the very essence of a dark blue. Deep in chroma and dark, without being grayish and with a shade of ultramarine/purple. Love it. 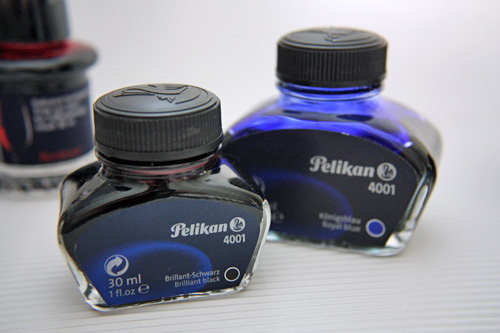 Pelikan 4001 "Royal Blue" and "Brilliant Black"
Pelikan “Royal Blue” and “Brilliant Black”, my old schoolmates. I don’t use them too often anymore. When writing black I nowadays prefer the waterproof inks and when writing blue I prefer darker blues. Also I’ve noticed that those ink erasable blue inks tend to fade with time, be careful when using them and don’t use them for important documents. Mont Blanc “Blue Black” was one of my first dark blues, however it is far too grayish for my liking. I clearly prefer the Private Reserve dark blues over it. 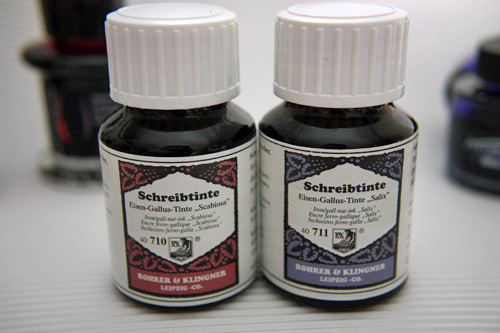 Also I’ve heard some rumours that this particular ink would be a iron/gall-nut ink as well. Anyway, the design of the bottle is neat as it’s helpfull to use up all the ink up to the last drop. Once the ink is finished (or more likely all dried up, because I scarcely use it 😉 ) I’m going to reuse this bottle for my other inks. 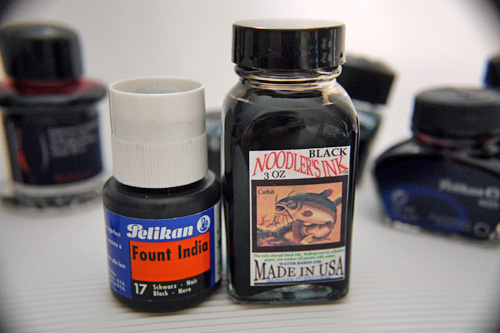 Pelikan "Fount India" and Noodler's "Bulletproof Black"
Finally my drawing inks, Pelikan “Fount India” and Noodler’s “Black”. Both of them can be used in pens, the Pelikan “Fount India” has a slightly better flow, yet the ink tends to bleed more into the paper than the Noodler’s “Black” does. 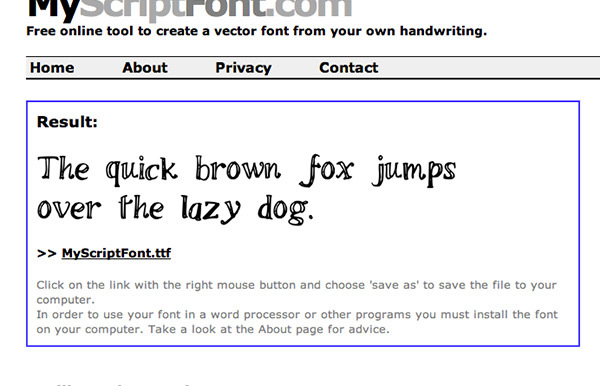 So optically you always end up with a line that seems to be bolder when drawing with Fount India. Hence I prefer Noodler’s for the finer details. Both are waterproof, yet I’d advise you to make a first try on a scrap piece of paper. 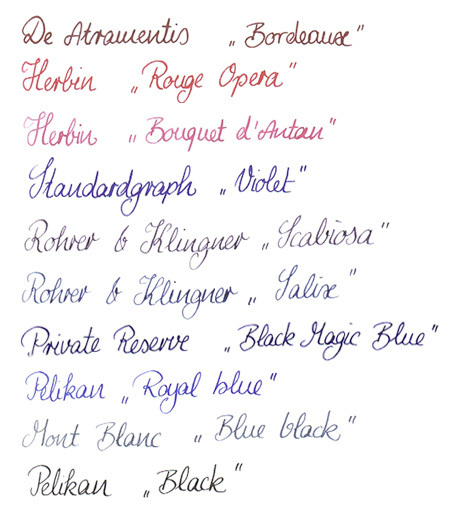 One more note, all these samples were written with a dip pen which causes some of the colors to look darker than if they were written with a regular fountain pen. 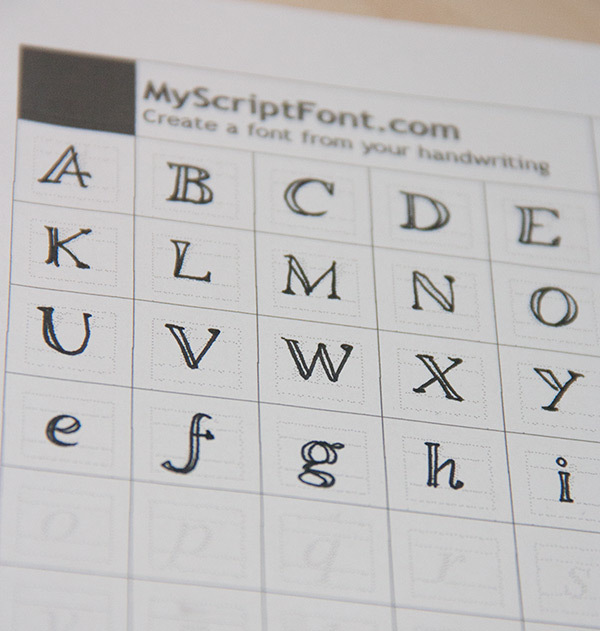 For instance the first color “Bordeaux” looks almost like a dark brown in this sample, when written with a fountain pen it will look more like a dark red though. It has been brought to my attention that there are a few people who do not dare to use the pen cap for changing the nibs, because they are afraid that this method could ruin their nibs. Please rest assured that as long as you don’t exert too much force while pushing the cap onto the nib nothing bad will happen. Anyway, for those who prefer a method other than using the pen cap or their fingers for pulling off the nib, here is the tape method. Yet, please let me state beforehand that I do not recommend this method. Some tapes don’t adhere well enough to the nib to get it off, especially if you haven’t cleaned off the ink properly, whereas other tapes are horribly sticky and tend to leave glue residue on your nib. 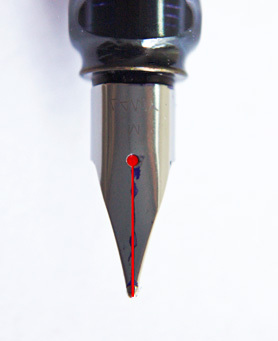 Be careful, if this residue gets into the part of the ink flowing system of your nib it will be ruined. The right way to use sticky tape would be to cut a piece to this length, like illustrated in the picture below. Most tapes will be wider than that, so you might have to cut the tape in half. 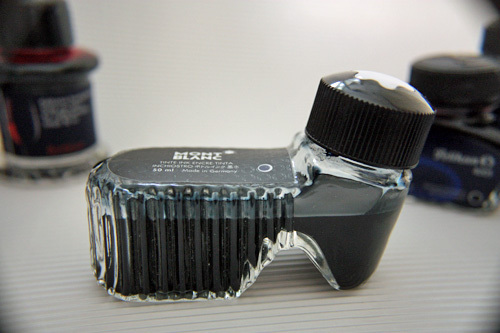 Gently clean the nib and make sure there isn’t any ink (or water if you have just cleaned your pen) on the nib before applying the tape. Then pull gently on the tape until the nib slides off. 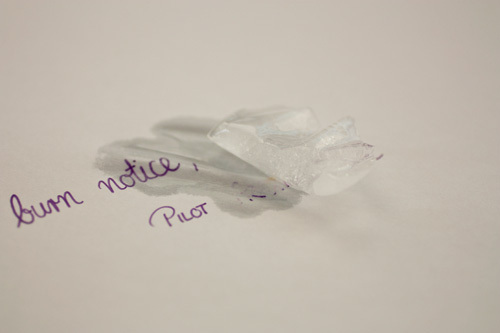 In the best case the ink therein will spread under the tape causing it not to stick to the nib, yet in the worst case glue residue from the sticky tape might clog up your ink flow. And believe me, it’s very difficult to get glue out of a nib, most likely you will have to get a new one.